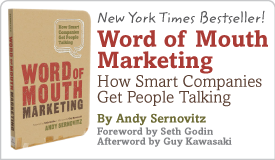 4 key groups to train on word of mouth ethics | Andy Sernovitz | Damn, I Wish I'd Thought of That! ← I can’t code, and you can’t sell crap. Nobody is going to put their reputation on the line to recommend you if they have any questions about your trustworthiness. Your junior staffers represent some of the biggest risks in getting your brand into an ethical scandal. Sure, they’re probably very familiar with social media, but what worked to promote the fraternity party or the student election campaign might not be acceptable under FTC rules and regulations. The good news: You probably already have training programs set up for new hires and can add ethics education to the regular curriculum. The FTC has made it clear: You are responsible for the people you hire. Train your agencies on your word of mouth and social media ethics standards and require them to meet or exceed them. Frankly, your agencies should be training you on the laws and the ethics — and if they’re not, you should be concerned. Just like you’re responsible for the people you hire, the FTC has also made it clear that you are responsible for the bloggers you recruit to talk about you. Require them to disclose their relationship with you and any compensation (cash, freebies, perks, etc.) they’re receiving. And remember: Disclosure must be clear and conspicuous to the average user — and not buried in some paragraph deep on the “About Me” page. Educate your executive leaders on the ins and outs of word of mouth and social media ethics. It’s critical to protecting brand reputation, and your training will help them in both their leadership roles and in their personal use of social tools (because just like new hires, senior execs seem to be particularly vulnerable to breaking these laws). Show them that this stuff isn’t just for the marketing or PR teams to worry about. Show them it’s something the entire company needs to be aware of.